Our final Summer Field Walk this year centred on a Saturday afternoon stroll around four city centre churches. 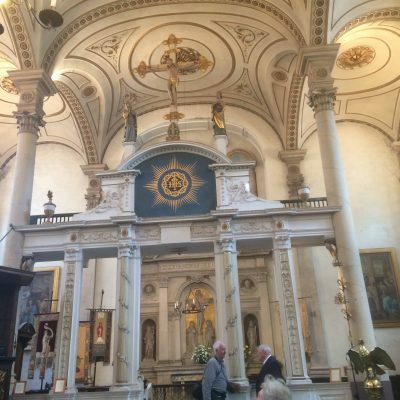 Given the pre-set two hour or so time frame the intention to cover the history, architecture and touch on the pious intent and social mores of the respective mercantile parishioners may have proved over ambitious! However, we completed the afternoon albeit with a time overrun. All four churches were established by the late 12th century and thrived during the period as a consequence of wealthy parishioner support. However, since the Reformation, two have undergone radical rebuilding. 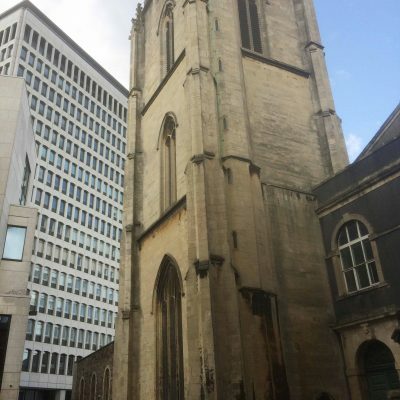 St John the Baptist (St John on the Wall) is perhaps the most well-known of the foursome and readily identified as the last of the four Bristol churches still retaining its position on the original town wall. 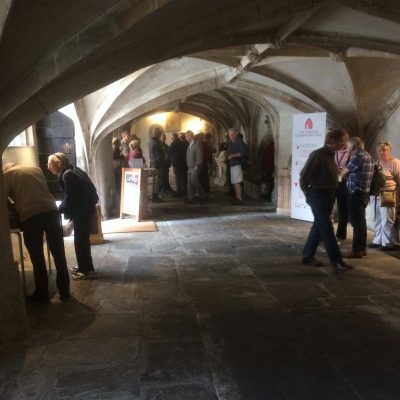 First mentioned formally in 1174, the building seen today primarily dates from between 1350 -1500. The upper church contains many features of interest including the splendid tomb of Walter Frampton (died 1388) a major patron. The crypt below once served as the chapel of the Brotherhood of the Holy Rood and has work of the early and late C14 together with a fine alabaster tomb of Thomas White (d 1542) and his wife Christiana. Moving on up Broad Street we next visited Christchurch. 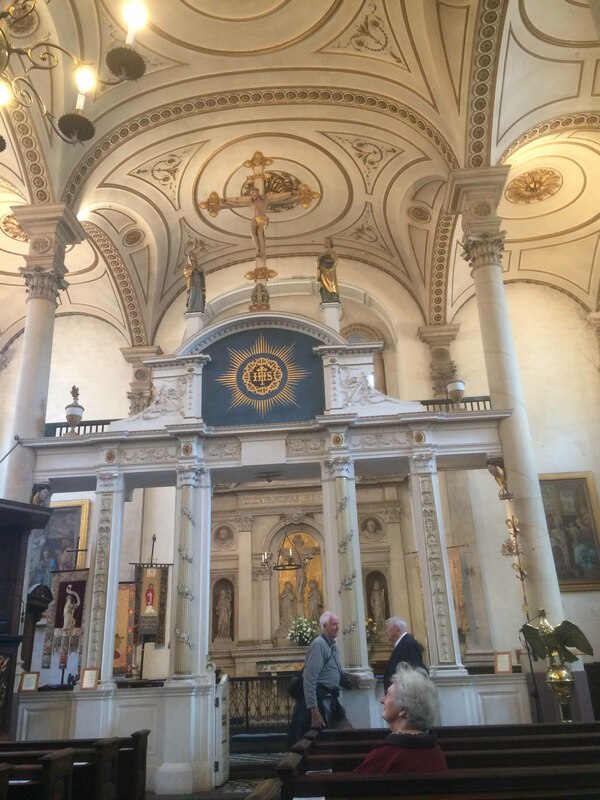 Once the Holy Trinity the church was totally rebuilt in 1786-90 by William Paty. 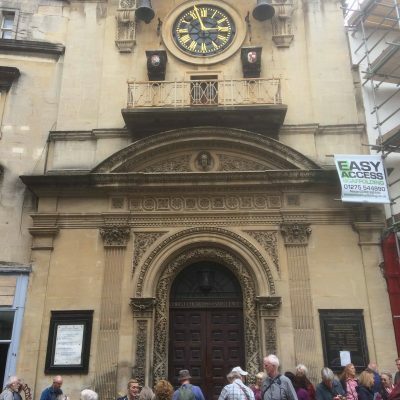 There are many features which reflect work at St Martin-in-the-Fields and the building is considered to be the finest of Bristol’s surviving C18 churches. Sadly the famous quarterjacks are no longer in situ but plans are in place to complete refurbishment and reinstate them in the near future. Crossing the river we came to another Georgian reconstruction; St Thomas the Martyr. Once an impressive foundation which matched St Mary Redcliffe for architectural finesse the structure by the mid C18 had deteriorated to the extent a total rebuild was eventually deemed necessary. This was undertaken by James Allen in 1789 – 93. Sadly the only substantial remaining elements of the church are four large roof bosses which currently languish under stored materials at the base of the tower. Hopefully the CCT will at some stage find a way to display these wonderful pieces. Finally, we arrived back in the centre of the old town and All Saints in the market. Since the closure of the Diocesan Education Centre the church has been largely inaccessible so our group were most fortunate in being granted rare access. Essentially very much a church the earliest visible work is the two Norman bays dating from 1140. Famously, for much of the period, the northern part of All Saints housed the Guild of Kalendars meeting room and library. Much rebuilding took place between 1430 – 50 and further substantial works in C18 and C19. Despite these interventions the church strongly retains its essence and character. Plans are now being made to return the church to active religious usage . Despite a rather ambitious agenda we managed to complete the tour albeit with an extended time frame. Most of the party appeared to forgive this especially as we were afforded access to All Saints. Huge thanks are due to Mr Roger Metcalf for arranging access s and acting as our guide at All Saints and Christchurch. Thanks are also due to the CCT who facilitated access at St John the Baptist and St Thomas the Martyr outside of the normal opening hours. Christchurch with St. Ewen. 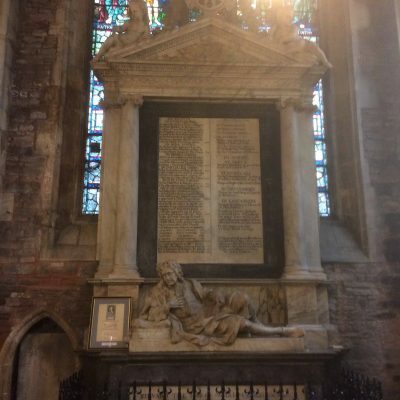 Edward Colston’s tomb. St. Thomas’s church In the crypt of St. John.